Gibson Johnny A - Are different colors worth more? Discussion in 'Guitars in General' started by droptopt, May 19, 2008. 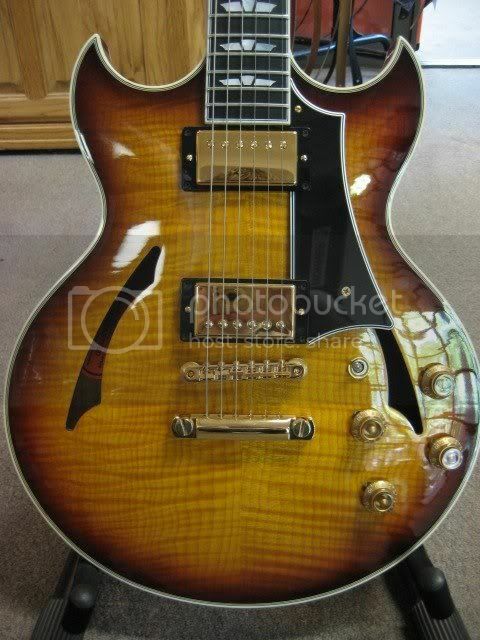 Thinkig about buying a Johnny A signature with a figured maple top. Of the 3 colors, Sunset Glow, Amber and Black, it appears that the Sunset Glow is made the most. Does that mean that the black and amber colors are worth more? What about re-sale? If i bought a black one, would it be harder to sell? Same $, and I don't think resale is gonna matter much. They're all desireable. The black & amber are more rare but that burst has a lot of fans. Besides, you won't want to sell it. I think the black is probably going to be less desireable long-term, regardless of the numbers made. It's just not as generally popular compared to other colors. I saw Johnny A last Friday (in Bayshore, NY) and he played his black guitar all night (using the Bigsby all the time). It has a great gold"top" finish on the back and sides and the figure in the top really shimmers. Jeez , can't beleive I missed him. Anyway, I do thibk they look great in black. Mine is 1 of the early number chevron bursts. Lovin it. Well THIS black one got to me. Something about the black with gold hardware. Should be here this week. that thing is ridiculous! awesome score! Gotta say that black Johnny A is pretty fine looking. I'd be clibing the walls waiting for the truck on that score. Thanks for the kudos! I should have it in a few hours according to the UPS Tracking web information. 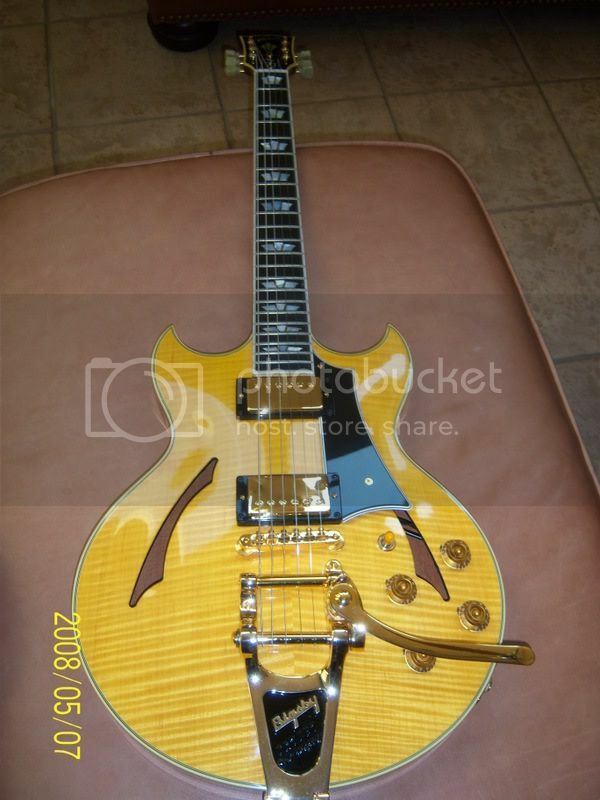 This is my first hollow body guitar so I'm very curious as to how it will sound. damn, that black 1 is amazing. Or are you busy playing it. If so, maybe we'll never hear from you again? Some of the natural tops have some beautiful maple on them, but otherwise I wouldn't think there would be a lot of difference in value. I have a SB model but I like the look of the black ones myself. The stop-tails seem to be cheaper, even though there are less of them out there, I prefer them over the Bigsby models personally. I have two - a Sunset Glow and one in transparent black (which was made for the 05 NAMM show).